GREAT BLACK HAWK IN BIDDEFORD!!!! No seriously. This is not a test, do not adjust your television. This is not a drill. This is insane, but it is real. 10:35 am. Tim Swain shares that post to the “ABA Rare Bird Alert” Facebook page. All hell breaks loose. While many people discuss the ID, others immediately jump to the conclusion that it is far too rare and far too out of range to be possible, so the conspiracy theories take hold. One person claimed to debunk it in multiple forums based on the plants in the scene. His plant ID was seriously flawed. I was brought into the discussion and identified the plants in the two pictures as all occurring in and around Biddeford Pool: Japanese Knotweed, Red Maple, and an invasive bush honeysuckle that I left as Lonicera sp (presumably tatarica). I know these thickets and habitats extremely well, and all looked just like a number of areas around here. While I was not vouching for the credibility of the sighting, the misidentification of the plants should not have impacted anyone’s decision to get the heck out there and search for it. And while skepticism and critical evaluation of exceptional sightings is important, I felt too many people were immediately looking to debunk it – that is not constructive, especially when using nothing more than simple misinformation spoken loud enough to be believed. Luckily, people were out searching for it, and didn’t need my plant ID to be encouraged to do so! Later in the day, Michael Smith was able to contact the photographer, and it turned out the bird was photographed only one day prior, on Maddox Pond Road in the Fortunes Rocks Beach section of Biddeford. The plot thickened. Birders searched the area extensively in the morning. The exact location of the photograph was confirmed. There was no hoax, conspiracy, or simple mistake/miscommunication. But there was no bird. 6:03 pm: Doug Hitchcox relocates the bird in a backyard on nearby Lily Pond Road. Birders converge. I arrived at about 7pm, and about 15 of us continued to observe the bird, with several remaining through dark. I managed a few phone-scoped photos. But, given the low light, I had better luck with video, which I did extensively. I posted one here, on our store’s Facebook Page. For the record, it was perched in a Black Locust when I saw it. 7:20 am: With dozens of people from several states converging and looking, it was refound on Lily Pond Road. And now all hell will really break loose! Jeannette went down this am and scored some great photos as the bird flew around, hunted eggs and nestlings (it was observed eating a nestling and robbing an American Goldfinch nest for eggs), and as since its first observation, being constantly mobbed by passerines (for good reason). For those looking to find it, I’d recommend the play-by-play on the ABA Rare Bird Alert Facebook Page. I’ll leave it to there, and the Maine-birds listserve, to provide the specifics on sightings, observation details, and any concerns (like extensive and problematic permit parking restrictions in the area) that may arise. Furthermore, Fortunes Rocks Beach is covered in Site Y11 in my Birdwatching in Maine: A Site Guide and Biddeford Pool (including parking tips) is extensively treated as Y12. Besides carpooling, my recommendations are to arrive early or late, or hoof it (I’ll throw a bike on the rack next time I go) a considerable distance from somewhere with open, public parking. And, like with several of the “Mega” rarities that have occurred in recent years, I am (somewhat) available for private guiding, including round-trips from the Portland Jetport! But since I have been asked by many people about “how,” “why,” and “WTF?” I figured I would pull some info together here for convenience. I believe those are the same features that are used to separate it from the Cuban Black Hawk (or Cuban race of the Common Black Hawk), but I need to do more research on that. Ah, but yes, those Florida birds. Here’s where things get murky. And while Great Black Hawks do not seem to be kept by falconers, they are kept in captivity. And with all records of exceptionally far-flung vagrants, captivity needs to be considered. The “cage bird” and wildlife smuggling plague in the world is rampant, and likely constitutes billions of dollars annually. While “charismatic megafauna” (or parts there of) get all of the attention, birds are being smuggled – as well as legally traded – all over the world. And I believe it is much, much worse than usually suggested, so it’s worth considering “provenance” and just because it’s not used for some purpose, I do not believe we can immediately discount captive origin. But let me be clear: there is absolutely no evidence of that here – no bands, no “cage wear,” no obviously problematic behavior – although it is rather confiding and does allow close approach which could be suspect. And more extensively treated here for those looking for the complete story of this complex conundrum, click here. Let me reiterate, there is absolutely no suggestion of non-wild origin, and while a hoax or miscommunication has been debunked, provenance (where it came from and how) must always be carefully considered. While listing powers-that-be may eventually decide whether or not you “can count it,” I would recommend going to look at this magnificent bird and, well, my list is my list…and I’ll probably count it! Besides feeling like the tropics these past few weeks, the weather pattern that has brought us this oppressive (well, to us in Maine not used to it) heat and especially humidity could very conceivably result in a bird escorted this far away from its usual home range. Although a resident species not particularly prone to wandering, some likely do, and presumably this would especially true of juveniles. Some have suggested this could even be the same bird as the South Padre Island sighting in April; photos will undoubtedly be studied carefully to see if there are any clues. Whether it’s the bird from Texas or another individual, the extensive and stubborn southerly flow created by a strong and persistent Bermuda High spinning off the southern Atlantic Coast would certainly facilitate the bird’s peregrinations. Whether originally “lost,” misguided, navigationally-challenged (simply mis-wired, or as one of the apparent impacts from our chronic use of pesticides), or just a “pioneer” prospecting for new habitats in the face of a rapidly warming climate and rampant tropical deforestation, there are a lot of ways where a large raptor that can soar with little effort and cover hundreds of miles in a day and end up in the Northeast. While weather rarely “causes” vagrancy, it certainly plays a role in where a vagrant could show up. Heck, North America’s first record of the tropical Variegated Flycatcher occurred (in November of 1977) in the Biddeford Pool neighborhood just up the road! Which is more exceptional would be up for debate, but clearly birds from a long way off can make it to Maine’s coast (for additional example, our relatively numerous records of Fork-tailed Flycatcher). And, as circumstantial evidence that the recent weather pattern is delivering birds from the south to New England, notice that New Hampshire currently has a Wood Stork and a Neotropical Cormorant! Birders are flying in from all over the country already, and likely hundreds if not thousands of birders will descend on the area in the coming days, and if we are all lucky, weeks. Of course, the bird could leave any minute now. Folks will debate provenance, and others will simply enjoy the sighting and take a lot of photographs. Hopefully, birders will spend a few dollars in the area (can I recommend Bufflehead’s restaurant on Hill’s Beach, Palace Diner in Biddeford, and Saco Island Deli in Saco to start?) and let it be known that they are here to see this epic rarity. Furthermore, there is always the chance of the “Patagonia Picnic Table Effect,” wherein birders descending on an area for a rare bird sighting find additional rare birds. What could be next? And from where? I very much look forward to what else is turned up. This could be fun. At the very least, don’t forget there is a Little Egret just up the road in Scarborough Marsh! Remember when, 4 years ago, that’s what everyone was flying in for? I’m not the first to say it, but it needs to be repeated. This is a quiet, residential area with extremely limited daytime public parking. The bird is often in yards, and since the best hours to visit are before 8:00am and after 5:00pm when parking is available at nearby Fortunes Rocks Beach, PLEASE be extremely respectful to local residents and private property. Do not enter any yard unless invited to do so, and do not block driveways. And yes, police have been actively patrolling the parking areas! And always, put the bird – and its neighbors – first, no matter how much you want a slightly better look or photo! Photo reviews by Tom Johnson and others of the April Great Black Hawk from Texas and our Maine bird shows the exact same pattern of brown flecks on the outermost underwing coverts. Variable in this species, this is too perfect to be a coincidence, so it is almost unquestionably the same bird! Unfortunately, at 1:52pm (I believe) on Thursday, August 9, the black hawk was observed flying over Fortunes Rocks Beach and “out to sea.” It has not been seen again since. Birders scoured the area for the rest of the day, and again on Friday, August 10th to no avail…and so far without turning up anything else of note. In fact, not even the Little Egret has been seen in the last few days (I looked carefully at every Snowy in Scarborough Marsh this morning when guiding for a family from Indiana). We’ll see if any interesting reports roll in by day’s end. This entry was posted in Birding in Maine, Rarities and Vagrants, Weather and Birding and tagged "Birds, Biddeford, Biddeford Pool, Birding, Fortunes Rocks Beach, Great Black Hawk, raptors, rarities, vagrants on August 9, 2018 by Derek. 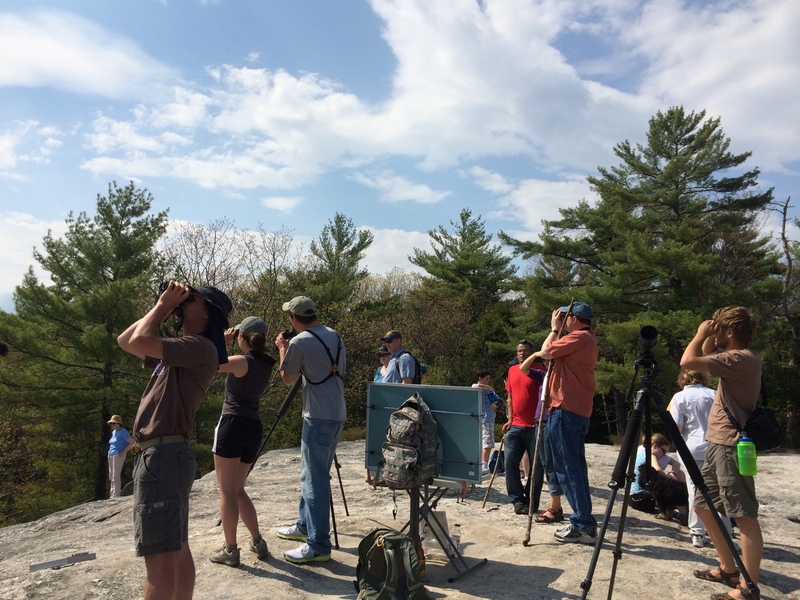 The 10th annual Bradbury Mountain Spring Hawkwatch wrapped up on May 15th, bringing a remarkable season to a close. Although I did go up for two hours to hope for a vagrant Mississippi or Swallow-tailed Kite on the 20th, netting five migrants (2 Sharp-shinned Hawks and 1 each of Broad-winged Hawk, Cooper’s Hawk, and Merlin. All immatures as expected on the late date). It was worth a try! Anna Stunkel, a College of the Atlantic graduate and veteran of the Lucky Peak hawkwatch in southwestern Idaho, was the 2016 Official Counter, and she did an incredible job. A tireless observer and interpreter, she introduced hundreds of visitors to the project, and to our numerous local Bald Eagles! While Jeannette and I covered her days off – when rain didn’t do the job for us – or whenever else we got a chance, our many volunteers, especially Zane Baker, Tom Downing, Dave Gulick, Chuck Barnes, and Rick Hartzell were priceless. No hawkwatch is successful without a loyal cadre of assistants – spotting birds, answering questions, and bringing food – so thanks to you all! The 2016 season total of 4,785 between March 15th and May 15th was our second highest total in the ten years of the project, and an impressive 17.6% above average (we exclude 2007 from our data analysis due to a change in methodology after this “trial” year). Oddly enough, we amassed this tremendous total despite losing 16.5% of our possible coverage hours (9am to 5pm EDT) to weather, including fog, rain, snow, or high winds. The 414 total hours of observation was actually 6.6% below our average. 343 raptors passed the watch on April 17th, topped by the 980 tallied on 4/22 and 585 on 4/23. Those two amazing days changed our season dramatically – we went from worrying about a record low count to dreaming about a record high! 3,165 of our raptors passed through between April 16th and April 28th, accounting for 70% of our total flight. Two rarities were recorded, headlined by a Black Vulture (our 7th of all time) on May 12th, and perhaps even rarer according to the season, a Broad-winged Hawk on March 20th (our previous earliest date was April 3rd, 2008 which itself was an outlier). We hypothesize that this was not a vanguard of the usual long-distant migrants arriving from Central America so early, but rather a bird that wintered either in South Florida or perhaps even well north of usual range thanks to the mild winter over the East. Although southwesterly winds – our best conditions – were rare this spring, numerous days of west and light northwest in April, combined with sunny conditions and few weather systems during the peak weeks of our flight produced our great count, led by above average numbers of Osprey, Northern Harrier, Sharp-shinned Hawk, Broad-winged Hawk, American Kestrel, and Merlin. On our biggest day (4/22), light westerlies eventually turned to the southwest, and westerlies rotated around to the southeast on the following day. However, the mild winter and early onset of early spring – including snow-free conditions over much of the area on the first day of the count and ice-out already occurring on larger rivers – got the season off to a quick start, but also meant we missed a number of birds that had already continued north before the count started on March 15th. Below average numbers of Turkey Vulture, Bald Eagle, Cooper’s Hawk, Northern Goshawk, Red-shouldered Hawk, and especially Red-tailed Hawks were the result. “Locals” of each from Day 1 also affected our count as we had to err on the side of caution early on to not overcount local birds (especially vultures and eagles) every time they flew around the mountain. It was a very, very different season from the 2015 count, in which winter never seemed to want to go away. 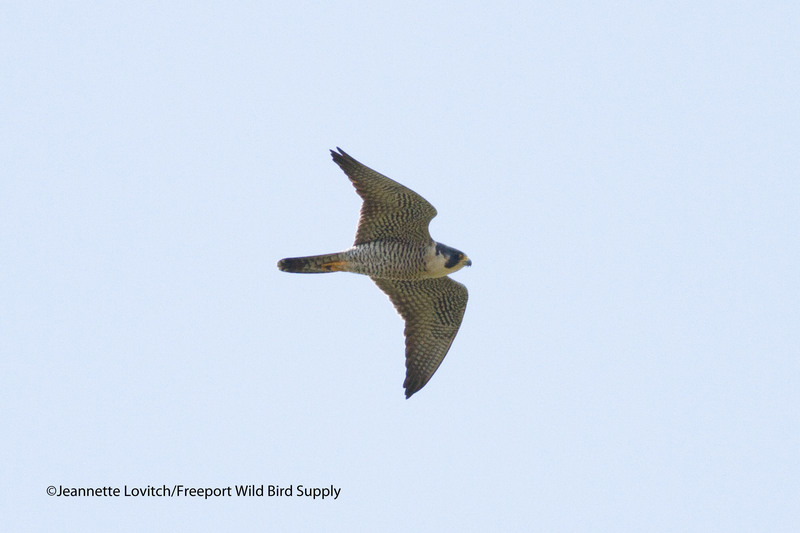 However, our record low 1 Peregrine Falcon is not as easy to explain – perhaps the constant westerlies just kept this predominately more coastal migrant far enough towards the coastline of Casco Bay. As always, we also keep track of non-raptor migrants to the best of our ability. 2,010 Double-crested Cormorants, 1457 Common Grackles, 1028 Canada Geese, 918 Tree Swallows, and 747 unidentified/mixed blackbirds led the way. Sandhill Cranes are now an annual occurrence, and this year we tallied four birds: 2 on 3/26, and one each on 4/16 and 4/25. The expansion/colonization/recolonization of Maine by this magnificent species continues, and our hawkwatch is apparently well placed to sample their return flight. Other noteworthy migrants included a White-winged Crossbill on 3/17, migrant Bohemian Waxwings on 3/26 (50) and 4/19 (29) with numerous visits by small flocks to the Common Juniper at the summit, and two Blue-gray Gnatcatchers (4/22 and 5/3). A total of 92 species were seen and/or heard from the summit, including regular vocalizations from local Barred Owls and a variety of warblers. Of course, this project doesn’t happen without your support of Freeport Wild Bird Supply, but we can’t do this without the support of Bradbury Mountain State Park and our co-sponsors, Leica Sport Optics. Our sincerest thank you goes out to Sunshine Hood, the new park manager at Bradbury (we can’t wait to grow the project with you! ), and Jeff Bouton and Stan Bucklin of Leica. But most importantly, this project doesn’t happen without all of you joining our counter at the summit, learning about raptors, migration, and conservation. To show your support for the project, and to raise funds for future needs (counter’s salary, new signage, etc), check out the exclusive Bradbury Mountain Hawkwatch t-shirt by North Yarmouth’s Coyote Graphics. It features Michael’s original artwork of the view from Bradbury within the outline of raptor on the front, and raptor silhouettes by the 2016 Official Counter, Anna Stunkel on the back. This entry was posted in Birding in Maine, Events and tagged "Birds, Bald Eagle, Birding, Bradbury Mountain Hawkwatch, Bradbury Mountain Spring Hawkwatch, Broad-winged Hawk, Freeport Wild Bird Supply, hawks, migration, raptors, Sandhill Crane, Sharp-shinned Hawk, Weather on May 21, 2016 by Derek. 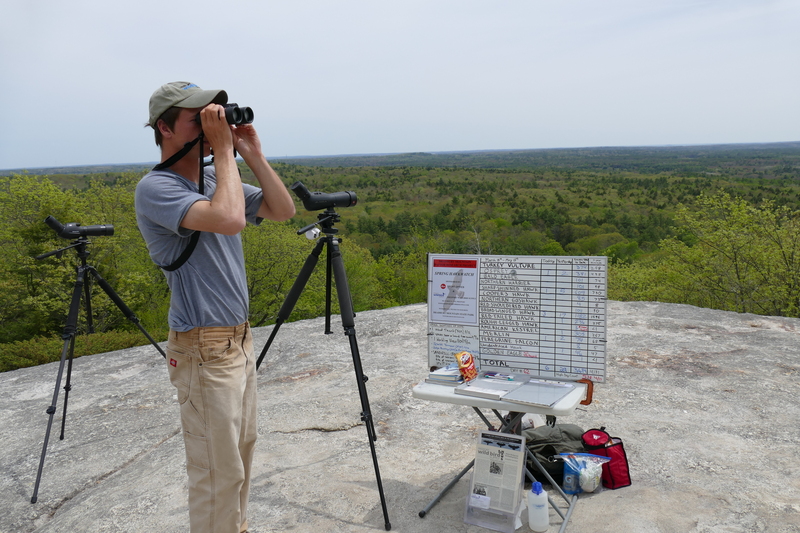 The 2015 Bradbury Mountain Spring Hawkwatch, co-sponsored by Freeport Wild Bird Supply and Leica Sport Optics, came to its conclusion on May 15th. This season was an interesting one, especially in how the weather affected our counts. During the 2-month period, the Official Hawkcounter, Andrew Wolfgang, tallied a total of 3628 raptors. This included vultures, hawks, eagles, and falcons. Over the 8-year span that we have conducted this standardized count, this year was the second lowest, coming in 12% below average. 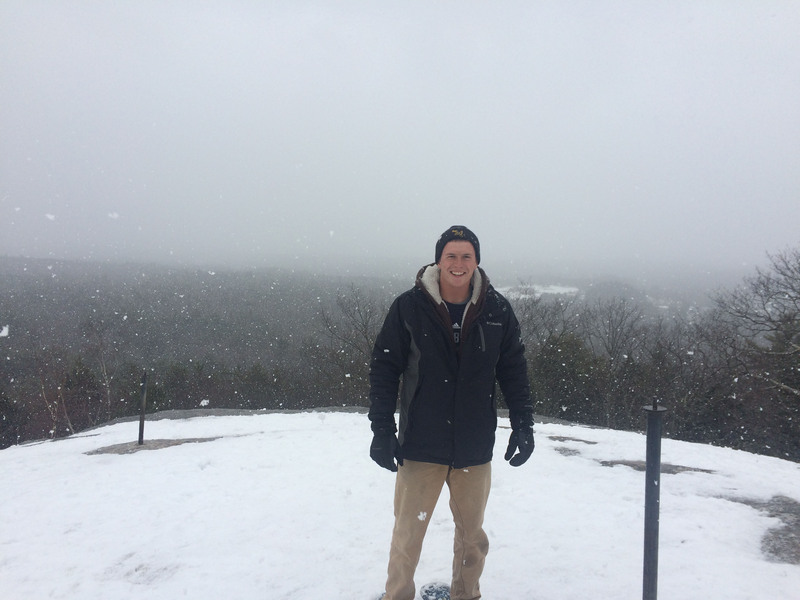 Welcome to spring hawkwatching in Maine, Andrew! However, a single year’s count tells us little beyond what the weather conditions were like during the course of the season. The late arrival of spring was actually a benefit to the count at the start, as few early migrants had progressed north by March 15th. Therefore, we had very good counts of our earliest migrants: Bald Eagles, Red-shouldered Hawks, and Turkey Vultures. 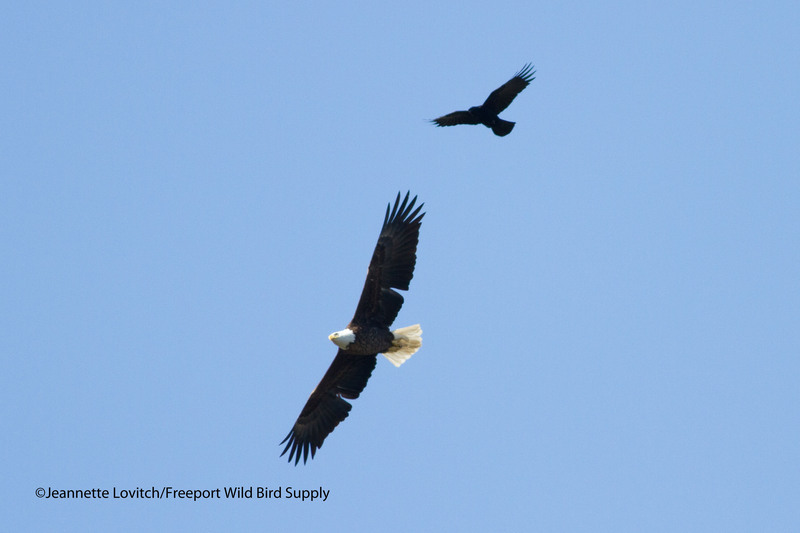 In fact, we set a new record for eagles deemed migrating, and vultures produced our second highest tally of all time. We simply didn’t “miss” any of these migrants before the project got underway. Bald Eagles set a new all-time record this season. However, as the season progressed, spring still didn’t seem to arrive. 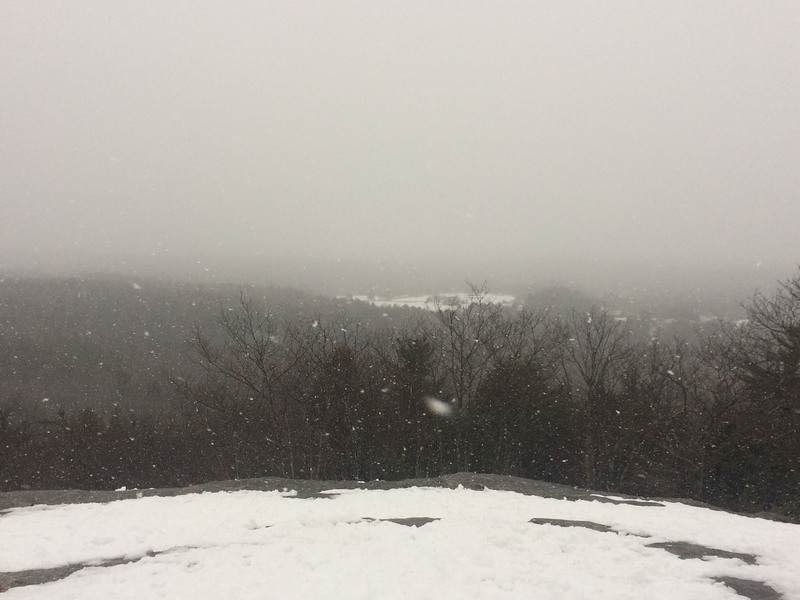 Lots of unfavorable (for viewing birds at Bradbury Mountain) winds meant that viewing migrating hawks past this mountain was not optimal. Strong and cold west winds, for example, push birds towards the coast beyond our view, while persistent easterlies seem to shunt birds inland before they reach the northern terminus of the coastal plain. Simply put, the poor conditions during the peak of our migration period in mid to late April really lowered the overall numbers and it’s those couple of weeks that can really make or break the overall count for the season. Therefore, the below-average numbers of our two most abundant migrants (Broad-winged Hawk and Sharp-shinned Hawk) combined to yield a below-average season total. However, we had some great birds once again, highlight by our 4th record of a Golden Eagle. Andrew also recorded a new record of 3 Rough-legged Hawks, no doubt due to the late onset of the spring’s flight (most Rough-legs probably move north before the start of the count in most years). Meanwhile, a total of 85 species were recorded, including an ever-increasing number of Sandhill Cranes. This year a total of 11 migrant cranes were recorded. Other highlights included frequent visits by Bohemian Waxwings to the summit for much of the first half of the count, both Red and White-winged Crossbills. Fox Sparrow was recorded at the summit for the first time as well (two dates). But, this hawkwatch is not just about the numbers. We also work hard to educate visitors to the park, both birders and non-birders. Every year we expose more and more people to the world of hawkwatching and bird migration in general. 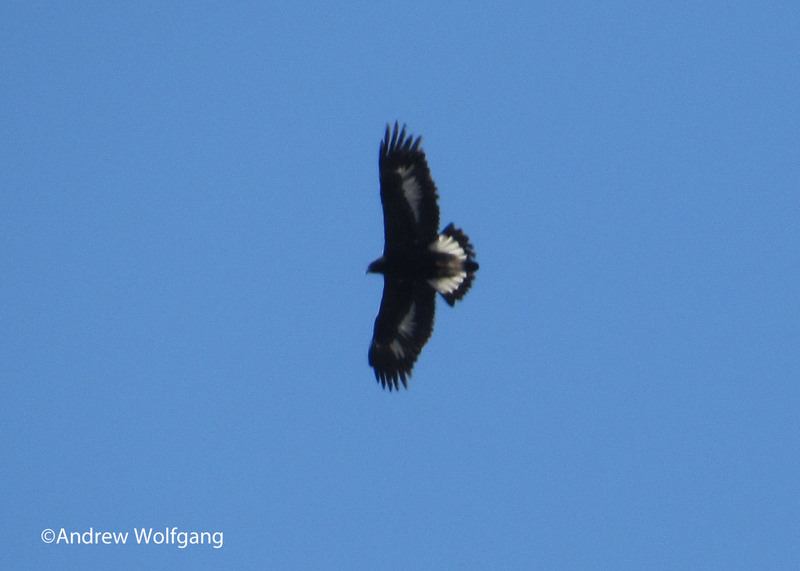 Bradbury Mountain is just one of many hawk migration sites throughout the continent. The data we collect becomes part of this vast network allowing researchers to determine population and geographical trends in particular species. So, even though our numbers this year were low relative to past seasons, it becomes no small part of building this data set. 1174 visitors were recorded at the hawkwatch (tabulated as coming specifically for the hawkwatch or spending time chatting with the counter), plus many hundreds more who at least briefly read the sign or asked a question or two. This was slightly below average, but likely due to the cool conditions for most of the season. There are few public projects where scientific data collection so effectively goes hand-in-hand with public outreach and education. With the growth of regular hawkwatch visitor volunteers, and especially the growth of the “Feather Over Freeport: A Birdwatching Weekend” festival, we look forward to many more years of introducing people to hawkwatching and hawk research and conservation. Peregrine Falcons just eclipsed our annual average this year; most migrants in this area stick closer to the coast. Our ninth Spring Hawkwatch kicks off again on March 15th, 2016! We invite everyone, whether seasoned veteran hawkwatchers or casual nature enthusiast, to join our professional biologist and naturalist at the summit once again. 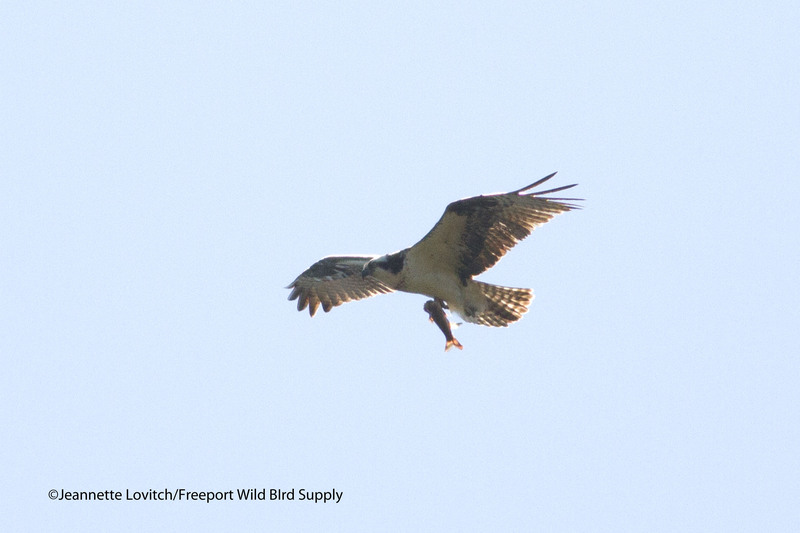 Ospreys are a fan favorite at the hawkwatch. It was quite a change in climate and the color of the scenery since the start of the count! 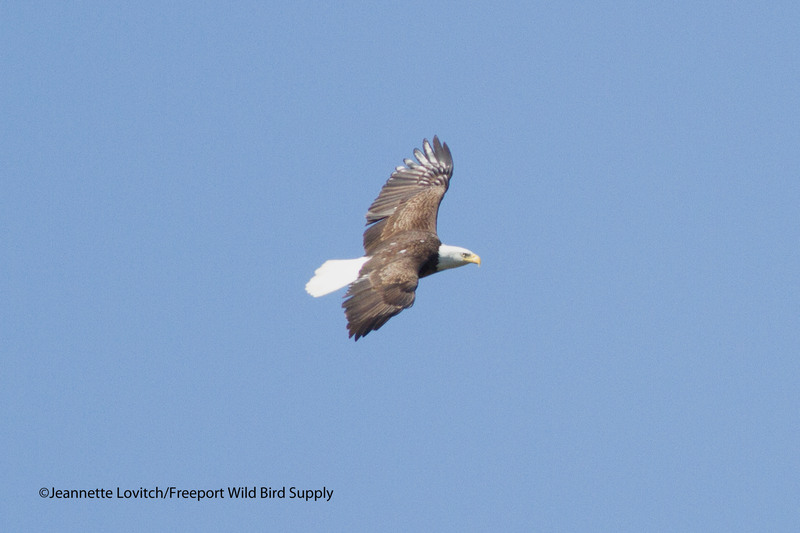 This entry was posted in Birding in Maine, Events and tagged "Birds, Bald Eagle, Birding, Bradbury Mountain Hawkwatch, Bradbury Mountain State Park, Feathers Over Freeport, Freeport Birding Festival, Freeport Wild Bird Supply, Golden Eagle, Leica Sport Optics, migration, Osprey, Peregrine Falcon, raptors on May 29, 2015 by Derek.